With his mesmeric blue eyes and mercurial manner, Peter O'Toole took the film world by storm in 1962 as the eponymous hero of David Lean's Oscar-winning epic, Lawrence of Arabia. The role seemed tailor-made for the then 30-year-old actor and thrust him into the superstar bracket, where he was to remain for the rest of his life. He was born in 1932, though where, exactly, remained a mystery, even to O'Toole himself. He claimed to have two birth certificates. One stated that he was born in Ireland, one in England, but he was certainly brought up in Leeds in a Yorkshire Irish family. His father, Captain Pat, was a bookmaker - a colourful character, the first of many to grace O'Toole's remarkable life. After a spell as a cub reporter on the Yorkshire Evening News and two years' National Service in the Royal Navy, O'Toole studied at the Royal Academy of Dramatic Arts and the Bristol Old Vic. He later said his studies at Rada under a scholarship began "quite by chance... not out of burning ambition but because of all the wonderful-looking birds". "I hitched to London on a lorry, looking for adventure. I was dropped at Euston Station and was trying to find a hostel. I passed the Royal Academy of Dramatic Art, and walked in just to case the joint." Following a London appearance in Shaw's Major Barbara, he was well received as Shylock and Petruchio for the Royal Shakespeare Company at Stratford. His triumph in The Long and the Short and the Tall at the Royal Court in 1960 brought him to the attention of director David Lean, who instantly invited him to play Lawrence. It was O'Toole's fourth film. The mid-1960s saw him at the height of his powers. He was the archetypal hellraiser along with the two Richards, Harris and Burton, but also found time to play Hamlet for the National Theatre Company. Film roles in Becket, The Lion in Winter and The Ruling Class, in which he played an eccentric English lord who believed that he was Jesus Christ, merely increased his reputation. But there were also great flops, unfocused and poorly written parts - in such self-indulgent productions as What's New Pussycat? - which threatened to knock O'Toole's glittering career off kilter. The 1970s saw the end of his excessive drinking. Although O'Toole once explained, "I just got fed up with it. And that was that", it came after doctors had diagnosed pancreatitis. After 16 years, his marriage to the Welsh actress Sian Phillips, with whom he had two daughters, Patricia and the actress Kate, also broke down. He returned to the stage in a blaze of publicity with Macbeth. The Old Vic production attracted the most vitriolic reviews of any play since the war. Crowds flocked and, financially at least, it was a great success, but the old-style acting favoured by O'Toole was unpopular with the critics. Later, though, his stage appearances were triumphs. Playing the title role in Jeffery Bernard is Unwell, a chronicle of the life of his friend, the legendary hard-drinking writer, O'Toole's versatility delighted a whole new generation of theatre-goers. Besides this, there was a highly successful West End run in Shaw's Man and Superman, Pygmalion on Broadway and work for Dublin's Abbey and Gaiety theatres. And he received critical and popular acclaim for his two volumes of autobiography, published under the general title Loitering with Intent. His seemingly effortless ability to play eccentrics was brought to the fore again in Bertolucci's The Last Emperor, where he played the Scots tutor to the young ruler of China. His portrayal of a drunken matinee idol in My Favourite Year, the only film he shot in the United States, was widely acclaimed. O'Toole's son Lorcan was born in 1983 after he had a relationship with the US model Karen Somerville. He was nominated for an Academy Award on eight occasions, most recently six years ago for Venus, but O'Toole's only recognition at the ceremony was with an honorary award in 2003. Cricket was one of his passions and he coached youngsters. Last July, he announced he was retiring from acting, saying it was time to "chuck in the sponge". O'Toole said: "I bid the profession a dry-eyed and profoundly grateful farewell. The heart for it has gone out of me." O'Toole was a man of great wit and intellect. The breadth of his ability, on stage and screen, in comedy and drama and, latterly, as a writer, was matched by the depth of his commitment to his work. A turbulent private life was mirrored by performances of real feeling. He was never afraid to take risks with his work and he was dismissive of those who went for the soft option. 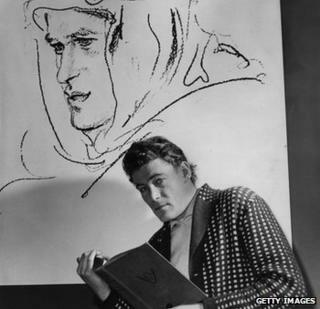 In an early poem, Peter O'Toole vowed to "stir the smooth sands of monotony". He undoubtedly managed this.